• As the inclusion movement continues to expand, the authors have revised several chapters to detail relevant inclusion practices and applications in both physical education and sport, helping to integrate students with disabilities into regular class and sport settings with guidelines for modifying activities. • The chapter on adapted sport is further developed to communicate and reflect on progress in the field and includes a Sport Framework for Individuals with Disabilities model to help develop and implement sport programs. 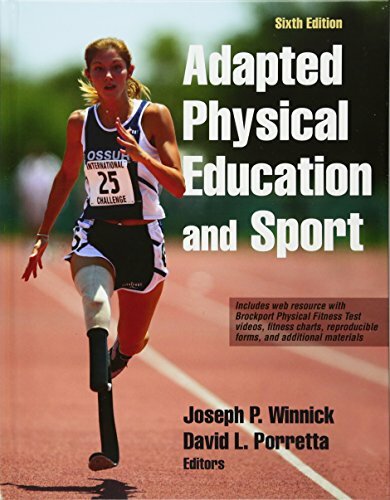 • The book gives attention to the revised Brockport Physical Fitness Test, and the accompanying web resource offers video clips that explain and demonstrate the criterion-referenced health-related tests that are applicable to many students with disabilities. • Advances and applications pertaining to behavior management and wheelchair sport performance are covered in various chapters. • The authors address the use of new technology as it relates to teaching and administration for adapted physical education and explore stand-alone apps that can be used in conjunction with the book that are useful in behavior management, fitness development, communication, social interaction, and physical education activities. • The authors give increased attention to the problem of obesity, particularly relevant to students with disabilities. • Many new authors and a coeditor have been brought on board, bringing fresh perspectives to the book and adding to the depth of experience provided by the returning authors and editor. The text is augmented by its ancillaries, which include an instructor guide, test package, presentation package, and web resource with video. The instructor guide offers chapter objectives, additional resources, and learning and enrichment activities that will help students master the content and extend their knowledge. The test package helps in building custom tests using hundreds of test questions and answers. You will find hundreds of PowerPoint slides that reinforce the text’s key points in the presentation package, and the web resource includes 26 videos of the new Brockport Physical Fitness Test in action as well as several reproducibles from the book.